The C Pure Minor uses eight notes per octave. Because of this same reason it is a member of the so called Octatonic -scales that have Eight-note (or Eight-tone). On the piano keyboard, it is made up of three black keys: Eb, Ab, and Bb and four white keys: C, D, F, and G. This combination makes this scale - as well as the C Prometheus, C Prometheus Liszt, and C Prometheus Neapolitan - as great choices for composing or improvising music. If we take a look a the key signature of the C Pure Minor Scale we can find it has three flats and no sharps. Therefore, on sheet music you will find three accidentals on the score. The notes of this scale are: C, D, Eb, F, G, Ab, and Bb. How to play the C Pure Minor scale? To play the C Pure Minor on your piano, start on the Root note. Play C, the first note of the scale. Continue with rest of the notes that shape the scale, play D, Eb, F, G, Ab, and Bb. Return to the home of the C Pure Minor scale. Play again C -the tonic of the scale- to mark its ending. How to play the scale in descending fashion? Begin on the last note. Play the C, the last (and first) note of the scale. Go down. Play Bb, Ab, G, F, Eb, and D.
Reach the home again. Establish tonality by playing the tonic of the C Pure Minor scale: C.
Tip. 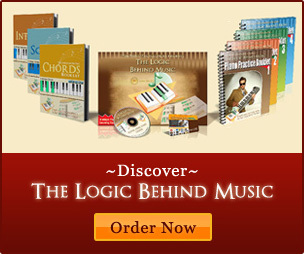 If you want to learn how to improvise or compose your own music using the C Pure Minor scale or any other scale, check out our piano improvisation and composition lessons and enjoy thousands of interactive multimedia piano animations. Copyright © 2005-2019 The Piano Encyclopedia. All Rights Reserved. 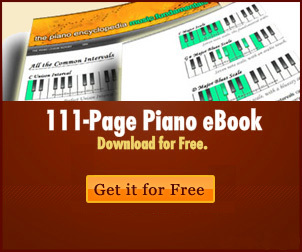 (PianoEncyclopedia.com).